I recently interviewed the guy single-handedly responsible for helping me understand and enjoy sports talk television - J.E. Skeets. And his journey towards being an incredible (and young) co-founder of The Basketball Jones podcast and contributing NBA personality for The Score has a lot to teach college students (and all of us) about how to make money doing what you enjoy – even in a tough and competitive industry. My interview with Skeets reveals what this incredible and continually rising sports media star did to get to where he is today – and do not be mistaken by the short length of this post. We are about to cover how Skeets has been working diligently towards this for the past 11 years. He’s also one of the nicest (and most engaging) people I’ve ever met. His story holds many secrets to success. See if you can uncover them. Could you tell me a little bit about your college journey? From there Skeets traveled to New Zealand and the Cook Islands. This dreamy “I’m off to travel to find myself” is hard to do when you come from a low-income household, as Skeets did. But he made it happen with, what I find to be a trend throughout his life: really hard work and relentless dedication to a goal. After traveling, Skeets got the idea that he wanted to work in TV, possibly writing and producing commercials. So when he returned home he applied to Ryerson University in Toronto, which had a great radio and television program. What was your first job out of college, and how did it lead to where you are now? If this were a normal success story I would jump right to the point where Skeets and his friends’ podcast was purchased by a major network and they were all living-the-dream creating sports content and becoming overnight sports media stars. But it’s what happens in between that that so many stories forget to mention. It’s glossed over and we read these stories and feel like failures. But there is hope. And Skeets had a lot to share about the hard, hard work that happened in between. Even though Skeets did not want a career as a physician’s recruiter, this job worked for him because it was flexible. It allowed him to develop the podcast with his friends on the side. And here lies the greatest lesson I learned from talking with Skeets.For anyone looking to do something outside the normal 9am-5pm job: you have to be willing to work 2 jobs (one without pay) for a long time. They did a daily podcast for free for four years. Think about that for a second. Four years. Two jobs. One income. No sleep. This is what it takes. Too often that part is left out. But those who achieve that level of success never forget that part. 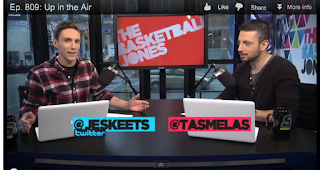 Today, you can see the work of Skeets, Tas, JD, Matt (and Trey and Leigh) in so many forms – their online show The Basketball Jones, their daily podcast and blog, and on the Canadian TV network The Score (shows I wish they had in the US, like Channel Surfing where they switch channels between games and give commentary). In addition, the NBA is starting to reach out to them to get them involved in what they are doing. What should my readers consider if they are thinking about starting something like a podcast, blog, vlog, or anything similar that relates to what they want to do for their future career? “Just do it!” Skeets says. “Try it and see if it works for you. What’s the worst that can happen? If you don’t like it or find you’re not very good at it, it’s okay! It doesn’t cost anything.” And yet, if it does work, you never know what opportunities might come from it. What’s really amazing is that you were picked up by AOL as a blogger in 2005, before many really knew what blogging was. You then were doing a podcast before many knew what podcasting was. I have to ask, what do you think is next in technology? You guys seem to be the youngest of what I would classify as well-known sports commentators; what advice do you have for others who are hoping to find success while they are young, especially in industries that do not have a lot of young people. ...Understand market need: Skeets started a blog in 2005 when a friend bet him he couldn’t write every day. He found he enjoyed writing his blog, and would write about almost anything. When he wrote about sports, other websites were linking to him, and his traffic went through the roof. Skeets did something key here – he started writing more about sports. He noticed what content interested people the most, and he focused on that. Play at different things, and don’t be afraid to notice what has the most potential to help you make a living. You have to have some interest and talent in it, but you also have to match that with market need. Interests apart from market need are wonderful and should always be pursued - they just won't pay the rent. ...Take risks to stay ahead: Skeets was always ahead of technology. And not necessarily on purpose. He was just active and unafraid to try something new, even if it was simply for a bet. Take risks. ...Have a team: Skeets notes how vital it was to have other guys with him in the podcast production adventure. “There was always one optimist in the group, and who it was always changed,” he said. He also frequently raved about the talent and intelligence of the guys who work with him and how integral they've been to their current success. Even if your venture isn’t a team-venture, surround yourself with positive people who believe in what you are doing. Self-doubt inevitably follows great risk (especially creative risk), and a few positive words from a trusted friend are as good as gold. ...Want it: It was obvious to me that Skeets is a really, really hard worker. He has such an engaging and fun personality, and yet it was so clear in his story that he and his team work really, really hard at what they do. And in order to work that hard at anything, you have to really want it. They wanted this, and that is what kept them going for so long, even when things were tough. Ask yourself if what you're pursuing in your life right now is something you really, really want. If the desire is absent, the necessary hard work can be difficult to muster. ...Enjoy it: Hard work definitely will not always be fun. But on some level, especially when you’re working two jobs, you’ll want to make sure you really enjoy your side-venture. Have fun with what you are doing. 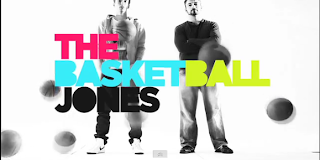 Check out an episode of The Basketball Jones (see below), and I promise, even if you aren’t into sports, you will enjoy yourself just be seeing how much these guys enjoy what they do. *Update 10/2/2013: Hard work pays off. Skeetz and his team are now officially on NBA TV! You can follow Skeets on Twitter. What is your study habit grade?